Home > Frequently Asked Questions [FAQ] > Pet Health > Can I Use Topical Flea and Tick Control With Wondercide Products? 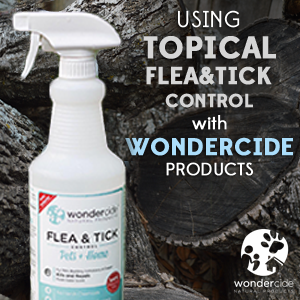 Many pet owners ask us if they can use various topical flea and tick control products alongside Wondercide products. Topical flea and tick treatments are the commonly used option pet owners apply monthly to their pets neck. Frontline, Frontline Plus, Revolution, K9 Advantix II, Advantage, and Fiproguard are all popular examples. 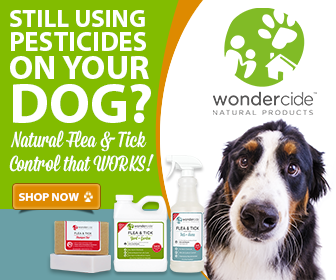 Is it okay to combine topical flea and tick control with Wondercide products? Is it safe to use Wondercide products before the month is up on my dog’s topical treatment schedule? Again, the short answer here is YES. Most topical flea and tick control treatments work by entering your pet’s bloodstream. Once the spot-on drops are applied to your dog’s skin (or the pills are consumed), the product seeps into the bloodstream and is absorbed into internal organs. Since these products take time to enter your pet’s bloodstream and then the pest’s body, spot drops generally take 24 hours to kill a flea. Our natural flea and tick spray is not absorbed through the skin, and it kills fleas, ticks, and hundreds of other insects less than two minutes after the product is applied. Because Wondercide products don’t enter the bloodstream, they should not interact or interfere with topical flea and tick control. This means you can apply Wondercide flea and tick spray immediately after applying a topical treatment. However, we recommend you wait at least a day to ensure your pet doesn’t have a reaction to the topical treatment. You can continue to use topical treatments if you wish. Be sure to follow the instructions on both the Wondercide and topical treatment labels. If you are thinking of using Wondercide to help prolong the time between applying conventional treatments, that can also be a smart way to reduce your pet’s exposure to conventional pesticides. I still see fleas and ticks. Do Wondercide products really work? Absolutely. Independent lab testing results prove our products kill 100s of bugs in under two minutes. If you’ve applied a product like Flea & Tick for Pets + Home to your pet but continue to see fleas, ticks, or other pests on your animal, it indicates the pest problem extends beyond your pet. The fleas and ticks aren’t just on your pet; they’re living in the environment. You likely have an infestation, probably inside your home and/or in the outdoor areas your pet frequents. You will need to treat the environment your pet lives in to completely get rid of fleas or ticks. Use Flea & Tick Pets + Home inside your home to immediately kill any fleas, ticks, or bugs present. 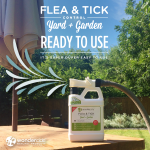 Then, use Flea & Tick Yard + Garden outside in your lawn and/or garden to kill pests in those areas and create a barrier around your property. Wondercide products kill stages of the bug life cycle – eggs, larva, and adults – and the cedar oil in our products creates a strong barrier around your pet, home, and property to keep future bugs out. Am awaiting my first shipment of Flea & Tick Pets + Home, as well as REPEL soaps. One question. Any problem with my pups licking their fur to which Flea & Tick Pets + Home has been applied? Also, can’t wait to try it – on the pups and myself, as well. The ticks have begun to appear in Northern Michigan. Hi Alicia! So glad to hear you found us and have ordered the Flea & Tick Pets + Home and REPEL soap. These are great products that will help you and your pups see some relief soon! Flea & Tick Pets + Home does not contain any drugs or harsh chemicals and has no known toxic effects from licking of the fur. Sensitivity may occur after use of any products for pets. If signs of sensitivity occur, bathe you pups with mild soap. I hope this helps, but please let us know if you have any other questions! Just heard about your product while surfing the internet and hoping it works as well as those reviews proclaim…..we have ordered it after fighting a losing battle against the fleas and our little hero,Roscoe. I feel terrible right now…have been spraying him with toxic chemicals after applying Frontline almost a month ago,bathing him with flea shampoo every 2 weeks……He’s not even talking to us right now.I will let you all know as soon as it arrives…. I received a sample size of Flea & Tick Pets + Home with no application instructions. How do I apply to my cat? Spray small area, spray all over???? Hi Dianna! So glad to hear you received your sample. Brush the hair backward to expose your pet’s skin and then mist the coat. Work the spray as close to the skin as possible. For application around the face and ears, spray your hands and work into the coat. Repeat as needed, or every 2-3 days for maintenance. Let us know if you have any other questions! Is your product save to use/spray on cats since they lick to keep clean and probably will try to get some of the spray off? Thank you. Thanks so much for your question. Because Wondercide is made exclusively with human food grade ingredients, it is safe if your cat licks him/herself after application. That being said, cats are more sensitive by nature, so we recommend testing a small area 8 hours prior to a full body application. If a large amount of solution is ingested through grooming, you may see that your pet seems lethargic or is experiencing increased salivation. Both are expected and no cause for alarm. Cedar is often used in aromatherapy as a relaxant, which is why your pet may seem lethargic. As a best practice, try to keep your cats from grooming themselves immediately after application until the solution has had time to dry. We hope this helps, but please let us know if you have any additional questions! Hello, Mary. Thanks for your question about using Flea & Tick Control for Pets + Home in conjunction with other products. Our products are made from 100% naturally derived, human-grade ingredients and are safe for dogs and cats. Customers have shared with us for years that our products have been used safely alongside other treatments without issue; however, because we have not done testing specifically with our product being used simultaneously with other preventative medications, we cannot guarantee how they will interact. Or label recommends spraying a small test spot on the back of the neck before a full application to test for any sensitivities or allergies. In cases like this, we would definitely recommend following this protocol, even if you’ve previously tested and used our products in the past. 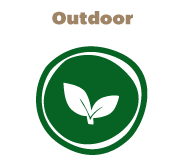 We also always recommend deferring to the label directions for any products used on your animals. This includes our products, as well as any that may have already been used on your pet. Wondercide products were designed to replace monthly flea and tick topicals, and are effective at killing a variety of pests by contact when sprayed directly. The products also work as a repellent. With regular use, you may find that you are able to keep your beloved pets pest-free with Wondercide alone! We hope this clarifies things, but please let us know if you have any other questions. We’re here for you! Have a great day. Thank you so much for your reply. I love your product. I have allergies to chemicals and don’t like using them on my pets at all. My oldest dog 17 years old was treated with the simparica a few weeks ago but hate that they have to be bite by a flea in order to kill the flea. I would rather them just eliminated before bitting my dog. I just bought and used my first bottle and the bar soap. The bar soap made my dog so soft and her fur so healthy looking besides taking care of the fleas. After she dried I applied the spray and after an hour I cant find a flea on my pup! She has seizures so I will not use chemicals on her. This is such amazing stuff I’m so pleased! Thank you so much for making such a wonderful, natural product. My pup smells great too! That’s wonderful! We’re so happy that the shampoo bar + Flea & Tick spray are working well for your pup. Thanks for sharing your feedback, and for choosing Wondercide! Can I give my dog and cat a bath with the wondercide bar soap and then use the wondercide flea and tick spray? Absolutely! The shampoo bars and Flea & Tick for Pets+Home spray can be used together. Starting fresh with a bath with the Flea & Tick bar is a great first step. Once fully dry, spray the Pets+Home as-needed to create a strong protective barrier for your pets while on walks or when visiting untreated areas.